Heh, your links have disappeared from the side-bar of your page. This is how I get to Cho and LunchNotes! The theme music started playing in my head as soon as I saw the image. I bet it repeated itself ad nauseum in your head as well while you drew this wonderful homage. Great work as always. 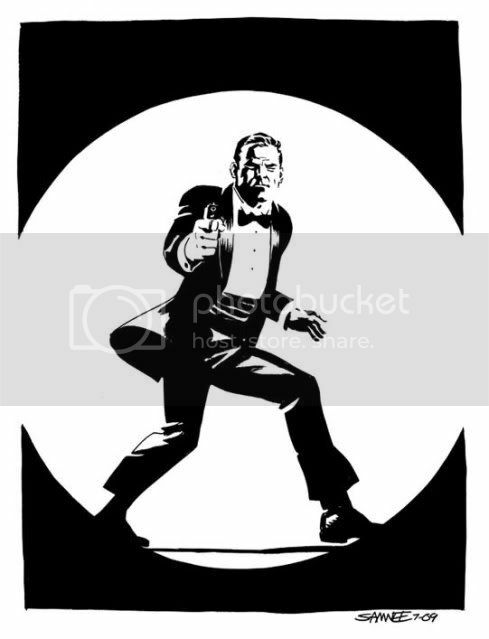 Why isn't someone publishing a Bond comic? I was going to go with "Great. Really Great." But Alan already beat me to the punch. I am not a major Bond fan, however, this came out Fantastic! Really sharp and totaly captures the mood.